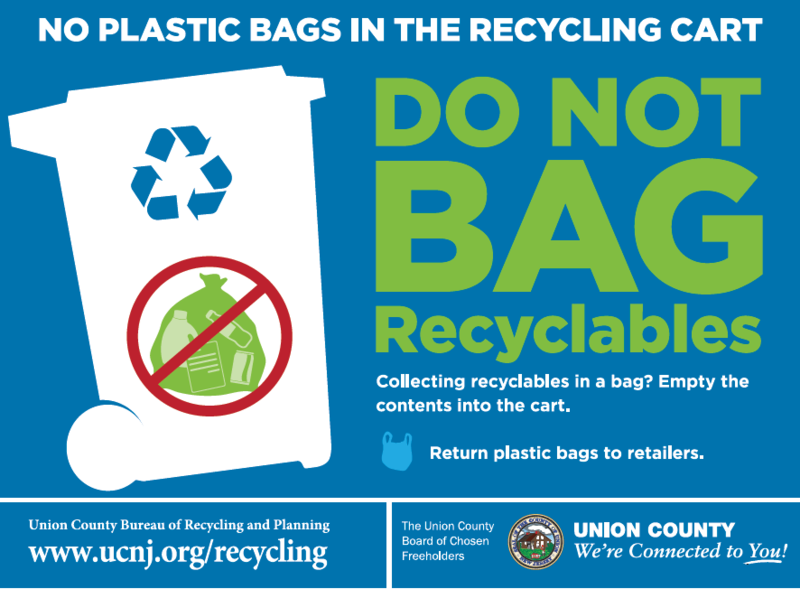 Union County, NJ – The Union County Board of Chosen Freeholders reminds residents that plastic bags and other excluded items cannot be recycled through their local curbside pick-up programs. In particular, Chairman Granados noted that plastic bags are prohibited in all curbside pickup programs. Plastic bags can be recycled through a designated retailer, such as a local supermarket or department store. To search for a convenient drop-off site, use the free location finder at plasticfilmrecycling.org. 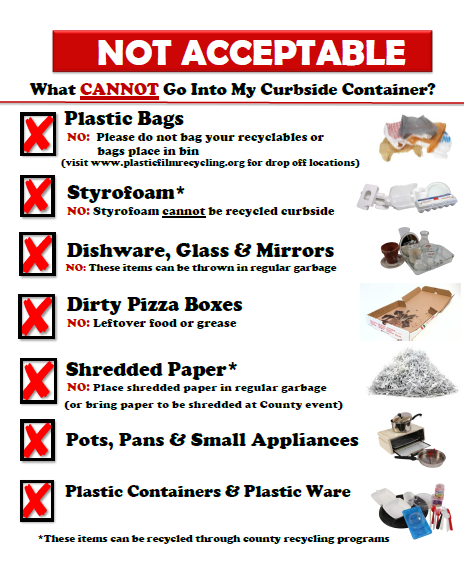 Chairman Granados also reminded residents to be alert for changes in recycling guidelines. Plastic bottles and containers that are coded with #1 or #2 on the bottom. Aluminum and steel (tin) cans and lids. All sizes, shapes and colors of glass bottles and jars. Corrugated cardboard boxes such as cereal and clean pizza boxes; and milk, juice and fruit cartons. All mixed paper, including newspapers, magazines, junk mail, catalogs and phone books may be recycled. The exception is pre-shredded paper. Residents who need secure shredding for personal documents can use Union County’s free mobile shredding events. Plastic bags or other plastic film. Styrofoam — check your municipality for drop-off location, if any. Dishware, glass and mirrors — can be thrown in regular garbage. Dirty pizza boxes — no leftover food or grease can be included. Shredded paper – bring personal documents to a free mobile shredding event. Pots, pans and small appliances – check with your municipality for scrap metal drop-off location, if any. Plastic containers and plastic ware. 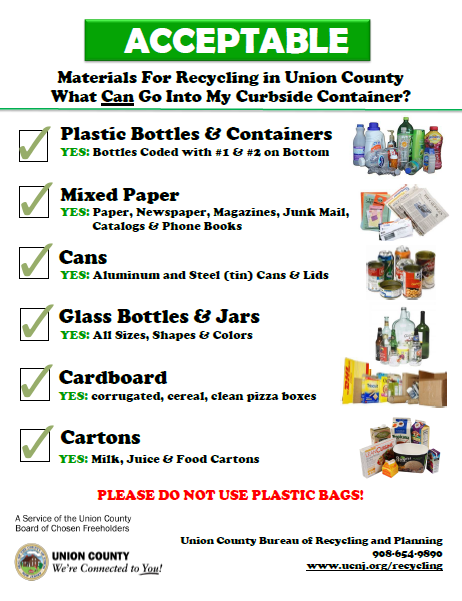 For more information on local and countywide recycling programs, FAQs about curbside recycling and a list of municipal recycling coordinators, visit the Union County Bureau of Recycling & Planning at 908-654-9890 or online at ucnj.org/recycling. Recycling supports the goals of Chairman Granados’s Moving Union County Forward “Plant a Seed” initiative for building participation in recycling countywide and engaging the public in conservation and environmental education. The Freeholder Board also encourages residents to sign up for Recycle Coach, a free app that makes it easier to stay up to date about countywide recycling information and municipal recycling schedules. More information on the Recycle Coach app can be found at ucnj.org/recycling/recycle-coach-app. Quick links to all Union County environmental programs can be found at ucnj.org/green-connection.